Last month a few of us RE staff members traveled to Las Vegas to attend the International Market. We spent two days walking three nineteen story buildings of the Market on a mission to find the newest or hand currated items for our three stores that would complement the already amazing vintage inspired items you now find at RE. After spending time in any of the various showrooms it was quickly easy to spot upcoming trends. It's everywhere! Ever since Pantone named the Color of Year of 2017 "Greenery" people can't get enough of it. With spring just around the corner, focus on freshening up your home by bringing, not only plants and flowers into your home, but consider painting a small piece of furniture green or adding green accessories. Since you'll need somewhere to hang your greenery it only makes sense that plant hangers are another trend. These hanging planters also are a great way to add levels and depth to a space in your home that may feel a little flat or dull. Super trendy for temporary spaces such as apartments, lofts or rental properties. Maybe one of our teams favorites was the use of geometric shapes. The use of these creates a cool pattern throughout your home and can give some common identity to the spaces. A very clean look with simple lines these shapes are perfect for those who crave a more modern look. 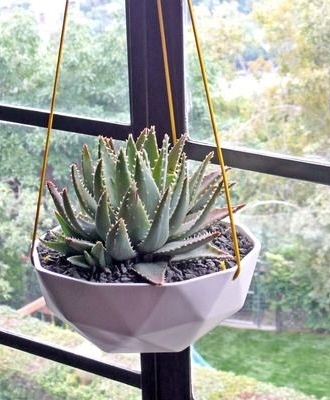 TIP: Combine all three trends by getting a geometric hanging planter and add greenery! Do you have a favorite trend that is not listed here? Let us know in the comments. Keep an eye out for these trends at Restoration Emporium!